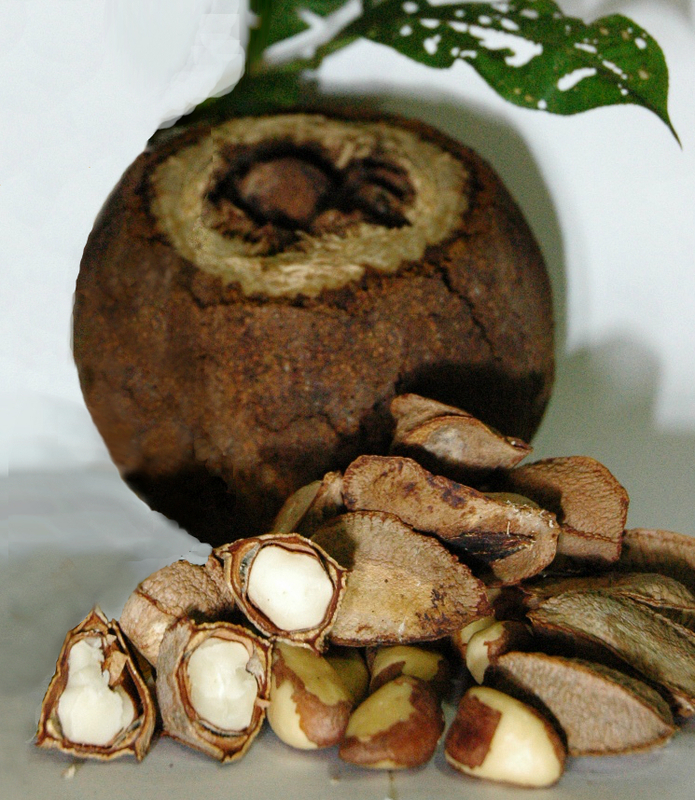 The Brazil nut tree is native to the Amazon rain forest of Brazil. The tree is known as castanheiro do para in Brazil and it is found all over the rain forests in Brazil, Columbia, Venezuela, Peru and Ecuador. These varieties of trees are gigantic and grow to a height of around 40 meters to 50 meters. The Brazil nut trees have spreading branches and flowers which provide habitat and food to several creatures in the forest. Some of the trees may survive for around 500 to 800 years. The tree bears large, woody capsules or pods that are rounded in shape and approximately of the dimension of a big grapefruit often weighing as much as 2.2 kg. 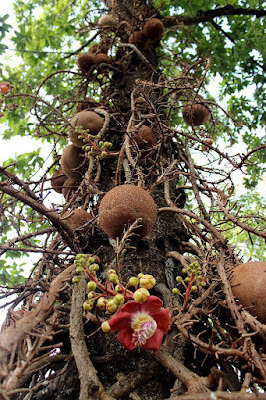 These large fruit capsules grow at the terminals of broad branches and when ripe fall from the branches during the period between January and June. 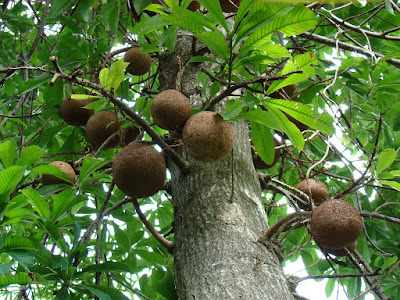 It is interesting to note that when the ripened Brazil nut fruits fall from a height of around 150 feet past the dense canopy like cannon balls, they produce a loud crashing sound. The core of the pods contains jammed orange segments that enclose around 12 to 25 Brazil nuts on an average. Each Brazil nut is enclosed by a separate shell. Established and full-grown Brazil nut trees usually bear around 300 or more fruits like this each year. Presently, commercial exports of Brazil nuts from the Amazon rain forest yield huge revenues to the countries in the region. In fact, money gained from the Brazil nut exports, which was started by the Dutch merchants way back in the 1600s, is only second to the earning from exporting rubber. In fact, as much as nine metric tons of Brazil nuts are imported by the United States alone! The entire production of Brazil nuts is obtained from the trees growing naturally in the forests as well as wild harvesting. The growth rate of the Brazil nut trees is rather sluggish and it takes anything around 10 to 30 years for a tree to produce the first crop of nuts. In effect, only a particular species of bees are able to pollinate the flowers of Brazil nut trees to enable the fruit production. Basically, these are the two main reasons why the Brazil nut tree is not suitable or viable for cultivation commercially. It may be noted here that the Brazil nut tree is an excellent instance of the complicated ecology of the Amazon where plants and animals are interrelated mysteriously. The processes involving the fruit production and propagation of the Brazil nut tree are rather strange too. While only a particular species of bees are able to pollinate the flowers that help in the production of the fruit, there is only one species of animal that has the capability to chew the extremely hard fruit pod and scatter the seeds to facilitate the propagation of new trees. It is interesting to note that the ‘agouti', a relatively mammoth mouse weighing up to 10 pounds and having very sharp front teeth, is the only animal that is capable of chewing the tough Brazil nut fruits and disperse its seeds to enable the generation of new plants of the species in the Amazon rain forest. In fact, the Brazil nut tree, the bees and the agouti are all depend on each other for their continued existence. The Brazil nut tree can be found growing naturally all over the rain forests in the Amazon River basin in South America. Thus far, it has not been possible to naturalize this species of plant outside the Amazon rain forests. Generally, Brazil nut trees are not cultivated owing to its complicated fruit production process as well as the very sluggish pace of growth. Hence, nearly the entire fruit production of Brazil nut is harvested wild in the rain forests of Amazon. Over the centuries, the natives of the Amazon rain forests have used the Brazil nut as a staple diet as well as currency for trade. The Brazil nut has several other utilities for the people of the Amazon rain forest. They use the empty seedpods or the shells as cups for drinking water and beverages, while some of them also make use of these vacant seedpods to contain small smoke-filled fires to drive away black flies. They also extract oil from the nuts that is used as a cooking oil, to lubricate high-precision machinery and also as a food for the livestock. In addition, the oil obtained from the nuts is used to produce hair-conditioning items, soaps as well as skin lotions. This oil possesses detergent as well as moisturizing features. Brazil nuts are also popular in countries other than those located in the Amazon rain forest and are generally available in the market all year round. People belong to the indigenous tribes of the Amazon rain forest region drink a herbal tea prepared by boiling the bark of Brazil nut to cure themselves of liver disorders. The traditional Brazilian herbal medication also includes drinking a tea prepared with the husks of the seedpods to alleviate stomach aches. In addition, as the Brazil nuts have a rich content of protein, vitamin E (a vital antioxidant) and monounsaturated fats, they are effective in combating a number of heart ailments. These nuts also contain an exceptional source of another antioxidant - selenium. It has been found that the amount of selenium contained in one Brazil nut is equivalent to more than 2,500 times of the mineral present in any other type of nuts. Selenium is a non-metallic ingredient that has proved to enhance mood and also the functioning of the brain. In addition, selenium also augments the blood circulation to the brain. The shape of Brazil nut is three-sided having a white tissues or flesh which encloses around 70 per cent fat and 17 per cent protein. For several centuries, the indigenous tribes residing in the Amazon rain forest region have depended on Brazil nuts as a vital and major staple diet. In fact, Brazil nuts were so imperative to these people that they have even used these nuts as trading goods within their community; much in the manner we use currency today. The indigenous tribes in the Amazon rain forest consume these nuts raw and sometimes pound them and blend the product into gruels. People living in the Brazilian region of the Amazon rain forest use the thorny stilt roots of Socratea palms to grind the nuts and then blend the grounded item with gruels to form a whitish pulp called ‘leite de castanha'. Subsequently, the mash is mixed with manioc flour. The food prepared in this manner is rich in calories, protein and fat and serve as a valuable nutrient for majority of the indigenous people residing in the Amazon rain forests of South America. As the fresh Brazil nuts are very rich in oil content, they may be used as small candles to illuminate homes during the night. The rural indigenous tribes of the region extract the Brazil nut oil and use it for a number of purposes, including cooking oil, oil for lighting lamps, making soap as well as feeding their livestock. Similarly, the empty seedpods of the herb locally called ‘monkey's pots' are used by the local tribes as cups to hold small smoky fires to repel black flies. In addition, these small wooden cups are also used to collect latex from the rubber plants and drinking water or other beverages. Moreover, the husks of these seedpods are used medicinally by the local people. According to the traditional Brazilian medicine, a tea prepared by boiling the husks in water is administered to people enduring stomach aches, while the bark of the tree is used to brew a formulation to treat liver diseases. Even in the United States, people use Brazil nuts and the oil extracted from them as a food. The oil extracted from Brazil nuts is transparent having a yellow color. It has a pleasing, sugary aroma and flavour. Brazil nut oil is excellent wispy oil that is perfect for dressing salads. Those who love salads may try using it with raspberry vinegar for delicious salad dressing. Moreover, Brazil nut oil is widely used in the manufacture of soaps, hair conditioning/ repair products and shampoos in South America. In fact, the use of Brazil nut oil in manufacturing the above mentioned products is fast becoming popular in the United States too. Precisely speaking, Brazil nut oil is an excellent hair conditioner that makes the hair silky, soft and glowing. In addition, hair conditioning products prepared with Brazil nut oil are also effective in restoring the dry and lifeless hair while repairing the split hair ends. Brazil nut oil is also a valuable raw material for the cosmetic manufacturers who use it to prepare various kinds of skin ointments and lotions that not only work to oil and dampen the skin, but also supplies the skin with antioxidants to ward of all types of disorders. Brazil nuts are the richest natural sources of selenium, a trace mineral, and this non-metallic element aids in preventing aridity of the skin, makes the skin soft, smooth and keeps it hydrated. Besides, this mineral possesses antioxidant properties that help us to avoid many diseases, especially cancer.